This is the best of black truffles. After being harvested, Truffles are carefully examined and first choice truffles are selected. 1st boiling truffles are only cooked once (instead of twice) in water for approximately 2 hours before being preserved and canned. Every time a truffle is cooked, it looses a bit of aroma, so 1st boiling truffles keep more aroma than regular preserves. This product is mostly used by professional chefs, but at Truffes.com, we believe that all our customers deserve the best and we make it available to retail gourmet customers. 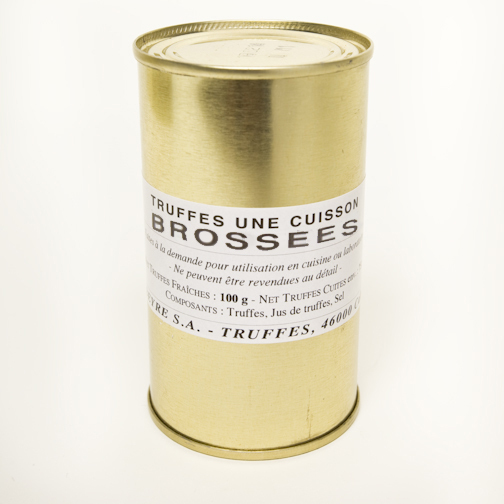 This product contains whole brushed French black winter truffles, harvested in France during peak season. These 'Perigord' truffles are preserved after a 1st boiling in order to retain maximum flavor and aroma. They are preserved in the truffle juice produced during the boiling process. Each can contains approximately 75% truffles and 25% truffle juice. The truffle juice is delicious and can be used for cooking in recipes. Brushed First Choice: Whole, top quality truffles with an irregular shape. 1st Boiling: Canned after the first boiling which retains maximum aroma and flavor; and yields 75% truffles and 25% truffle juice.